A Portable Sign Rental is an excellent low cost way to advertise your business. These roadside changeable copy signs are visually appealing, and grab the attention of motorists. Also known as marquee signs or portable advertising signs businesses find that the return on the investment of a portable sign rental is superior to almost all forms of advertising available. Use this sign to change your advertising sign message daily, weekly, or whenever you feel like it! Our temporary portable sign rental includes a box of letters. All you have to do is think up what you want to say to your potential customers, and simply insert the portable advertising signs letters! When considering your sales, grand openings, or special events, include a portable sign rental in your marketing mix. These “mini-billboards” are sure to draw the attention of your potential customers as they approach your business. Let them know you are out to get their business! 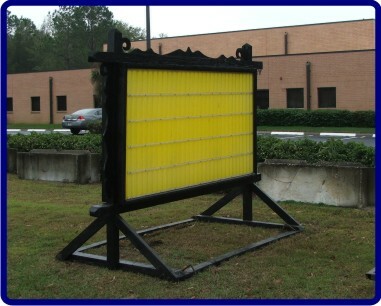 Portable Sign Rentals are available with yellow sign facing and black trim for optimal contrast. DELIVERY and INSTALLATION: Our direct service areas cover a portion of Central and North Florida. 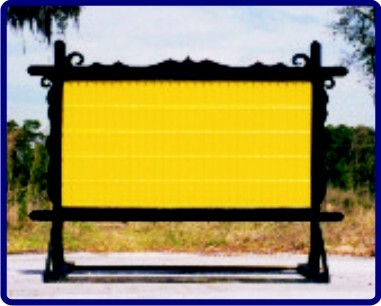 CLICK HERE to view our Portable LED Sign Rentals for Florida! Why Use Portable Advertising Signs? Portable Advertising Signs are an ideal short-term advertisement method because they offer unlimited control to the business they are advertising for as long or as short an amount of time as needed without having to make the choice to fully invest in an expensive sign. They provide on-site advertising that allows for flexibility in the message being communicated. Since the portable sign rental is professionally built with high-grade materials, they will last as long as they need to be rented, keeping their color regardless of the sun (and hold their own against the rest of the elements as well). This ensures that these portable advertising signs are a creative way to attract potential customers and communicate with current customers. Any time there is a message to get out to the local community, to those driving and walking by, a portable sign rental is a great way to communicate the message while also providing the location of where that product or service can best be found. 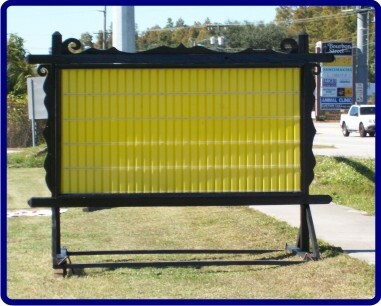 Having a portable sign rental allows those who are advertising to move their message as needed to find the optimal viewing location – most often next to the road, for those driving by. Eye-catching portable advertising signs is what lets potential customers know where a business is located, whether because they’re new or because the customer may have never had a need for their services before. Because a portable sign rental is so mobile, it is also always an option to move the sign to a different location to offer a business additional promotional opportunities. Giant Promotions delivers the sign to you. Once the sign is delivered and set up the only thing left to do is decide what message to communicate! Advertising can be a very challenging task for your business. But as with any task, with the help of the right tool, the job can become much easier and manageable. A very good tool for advertising is a portable sign rental that can be rented whenever you have a need for advertising your products or services and the space to do it. These portable advertising signs are very effective as they can easily be seen by motorists since they come in very catchy colors and are at eye-level. You can choose to change whatever the sign says when you want to. These portable advertisings signs come with a box of letter so you can change your message. Many businesses have already taken advantage of a portable sign rental because they have witnessed the benefits of such a technique. You can choose from different sizes according to your location. Make sure that it is not too small for its location nor too big but that it is eye-catching while not overwhelming your storefront. Your portable sign rental should be placed strategically. It must be easily seen and must be easy to read. Some people are not that observant that is why you must position your sign in a place that is open and where a number of people pass by.